More than 25 years ago, I found myself, once again, sitting at a conference watching a presentation by a major consulting firm. But this one was different from anything I’d seen before. The video showed what was then a fantastical scene of a woman getting ready for work. Standing in her kitchen, she told her coffee maker to brew a hot cup of coffee. She turned to her refrigerator and told it to add milk to the grocery list. She then switched on her computer for a quick video meeting with her team—all of whom were visible online as they discussed the day ahead. As she headed out the door, she asked, “What’s the weather today?” A voice that came seemingly from the heavens told her to go grab an umbrella: there was rain in the forecast. As a roboticist myself, the technology didn’t surprise me; I knew everything I was seeing was available in some shape or form at the time. What did surprise me was seeing that technology being applied in the real world—and not in an industrial setting, but in the home. Looking back, it’s almost shocking that it actually took so long for AI to find its way in through the front door. But now that it’s here, the reality is even more impressive than what I saw in that once futuristic video. Today, there are more than 10 million AI-assisted vacuum cleaners in use, and that number is growing every day. iRobot was the first to introduce an autonomous vacuum, the Roomba, back in 2002. Its newest models include Imprint™ Smart Mapping Technology, which uses machine learning to adapt to the specific cleaning needs of each room in your home, and the new iRobot mop. iRobot’s bots can navigate around furniture; clean rugs, hardwood, and tile; and can even be voice-controlled through Alexa or Google Assistant. And while Dyson’s newest vacuum cleaner may not run so independently, it does use complex AI algorithms to determine the level of suction power needed as you clean your house. There are also AI-driven window washers, stove-top cleaners, and self-cleaning litter boxes. If there’s something that needs to be cleaned, AI is coming to the rescue. Cleaning, of course, is just one way AI is making our homes more efficient. Amazon’s suite of Echo products, all armed with the Alexa speech interface, can now do everything from play your favorite music to control your lights, check on your family anywhere in the world via live video, manage your calendar, and order nearly anything you can imagine from Amazon. Google Home and its Google Assistant can also give you music, news, and weather on demand, and while it doesn’t yet offer the home management tools supported by Echo, it is at the ready to help do everything from start your washing machine (on the right setting, too!) to turn on your shower in the morning—before your toes even touch the floor. AI is also becoming popular for home climate control. Products like Nest offer smart doorbells (complete with real-time video, a 3-hour recorded history of what took place on your doorstep, and even face recognition software to keep you safe), Wifi-enabled smoke and CO alarms, smart thermostats that learn what temperature you like and then build a schedule around you, as well as door locks and more. It seems new AI-driven tools for the home are being introduced every day. Thermomix saves time by changing the way home chefs chop, steam, blend, grind, and cook entire meals. AI-enabled scales tell you not only how much you weigh, but also analyze your body fat, measure your water weight, and give you other statistics like bone and muscle mass, body age, basal metabolism, and more. And expect a new member of the family soon in the form of an AI personal assistant. Today’s winners include household robots­ with smart social skills, and products like the Beam System that allows you to video chat with family and friends from almost anywhere. Tomorrow’s options are likely to be better conversationalists and offer skills that will further transform your home—and your life—using the power of AI. For investors, the growing prevalence of AI in the home presents a tremendous opportunity. Not only are the makers of each of these innovations poised for future growth, but the underlying technologies that make them possible—machine learning, computing and AI processing, sensing, actuation, voice recognition, and more—are being applied in a wide variety of products, both in the home and across a vast landscape of industries. As the focus on AI and Big Data continues to expand, so will the prospects for investors who recognize and act on this inevitable trajectory today. Why Invest in AI? All about the core technologies! For some, investing in artificial intelligence feels like banking on the unknown. The concepts behind AI can range from sounding futuristic to downright fictional. And yet, when you break down AI and explore the core technologies that drive it, look at what they are delivering today, and consider what they are capable of delivering tomorrow, it’s suddenly quite easy to grasp how AI is changing the world around us. It is these facts that make investing in AI a not-to-be-missed investment opportunity. Back in 2009, I was the main editor behind the formulation of US National Strategy for Robotics. At the time, as the strategy worked its way through Congress and to the White House, the conversation about why robotics mattered was an easy one. In the key areas of application—healthcare, defense, manufacturing, and logistics—it was simple to understand the physical applications of robotics in the real world. And yet, it was clear even then that robotics was somewhat limited in its application because, but its nature, robotics is restricted to interaction with the physical world. AI is a completely different story. Since 2009, our world has been fully transformed by one thing: Big data. AI enables us to make glean value from masses of information by finding patterns within the data to elevate the decision-making process, often exponentially. The result is a new wave of AI-driven decision-making that is adding value in nearly every aspect of our lives. AI is helping retailers make better customer recommendations, customize their offerings, and improve product design, delivery, and desirability. AI is helping medical professionals save lives by enabling them to diagnose and treat diseases in its earliest stages—often before symptoms occur—and compare millions of test results to quickly identify effective treatments. On Wall Street, AI is helping fund managers find the best opportunities, using data to quickly analyze everything from macroeconomic and statistical models to industry and geographical trends. AI is giving lawyers and judges the ability to sift through information at lightning speed to make better, more informed decisions. In the oil and gas industry, AI is making it possible to drill deeper, improve rig safety, and even identity system failures before they create mechanical failures that can threaten workers and the fragile environment. Big data analytics is used to examine enormous data sets to discover patterns, correlations, market trends, customer preferences, and other often hidden information to inform the decision-making process. Using predictive models, statistical algorithms, and what-if analyses, big data analytics helps companies identify new revenue opportunities, create more effective marketing, deliver better customer service, improve operational efficiencies, and drive competitive advantage. Cloud technologies enable companies to store unlimited amounts of data and balance workloads within that data. Even more, AI and the Cloud share a fascinating symbiotic loop: the Cloud serves as the primary source of information that feeds AI networks, and AI networks continuously feed the Cloud with even more data. Already a key driver of competitive advantage and a coveted differentiator, Cloud platforms support some of the most important foundations of AI, such as cloud computing, machine learning, language processing, and more. Cognitive computing came into public awareness when IBM’s Watson computer famously beat two human champions on Jeopardy! and claimed the $1 million first-place prize. It was a brilliant marketing campaign to bring awareness of the power of cognitive computing to the public and, even more importantly, to the leaders of industry. Today, cognitive computing is used to accelerate processes such as reasoning, natural language processing, speech recognition, object recognition, and dialog generation. According to research firm IDC, worldwide spending on cognitive and AI systems is expected to increase by more than 50% by 2021, taking total spending on cognitive computing from $12B in 2017 to $57.6B by 2021. Network & Security is more important than ever in this ager of cyber attacks and data breaches, resulting in estimated double-digit growth from 2018 to 2023, leading to global revenue of $193.76B by 2023. As businesses strive to protect the personal and financial information of their customers and, indeed, their own reputations and futures, they rely on AI to support identity and access management, encryption, governance, risk and compliance, unified threat management, and security information and event management. Encryption capabilities are in particularly high demand to protect information stored on consumer devices and to use that information securely in the Cloud. Semiconductors are a key component of today’s digital capabilities, enabling every computer and electronic device. While semiconductors have been around for decades, AI is driving new semiconductor designs and capabilities. Using the power of machine learning and deep learning, industry leaders are finding new ways to speed up performance and reduce power, process data as patterns rather than individual bits. This progress is the key to delivering everything from quantum computers to fully autonomous vehicles. When we created the ROBO Global Robotics & Automation Index over 5 years ago, focusing on the broader spectrum made sense. It still does. But as the promise of AI has evolved into the new world reality of AI, it was clear that the time had come to create an index with a singular focus on AI. The result of our efforts is THNQ: an index that offers 100% pure-play exposure to companies that are investing in and delivering AI today—and changing the world as we know it. Every day, the deeper we dive into AI, the more opportunity we see. Of course, choosing whether to invest in RAAI or AI is not a clear either/or decision. Investors who are keen to invest in the physical application of technology—warehousing, autonomous vehicles, consumer robotics—will find ROBO to be the best fit. And there is certainly plenty of exposure to AI within the ROBO index; the overlap between the two indexes is currently about 30%. For investors who are seeking pure exposure into the fast-growing world of AI that is using the power of computing to drive better decision-making, THNQ is a unique option that enhances that exposure by honing in on AI alone and positioning investors to reap the potential rewards. 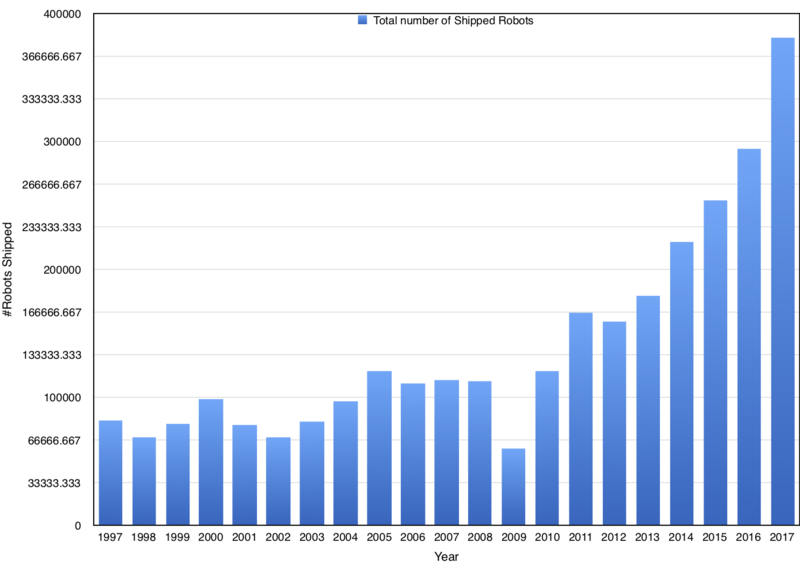 The robotics market is still booming. At the 2018 Automatica Fair in Munich, the International Federation for Robotics (IFR) presented a preview of the annual sales statistics for the robotics sector at the CEO roundtable. The final statistics will be published by IFR in cooperation with VDMA in October. The preliminary numbers are interesting in many ways. First of all the sales of robots increased by 29% year-over-year during 2017. The total number of shipped robots went up to 381 thousand units, of which 2/3 are sold in Asia. Combined US, Europa, and other regions only represent 1/3 of the total market. The by far biggest increase in sales was in China where the annual growth for 2017 was 58%. The growth is not only impressive but it is increasing every year. The Chinese salaries have increased close to 350% over the last decade, which in part motivates the need for increased automation. Also today 30% of all cars are manufactured in China, but few of them are sold internationally. There is a need to increase the quality of cars manufactured in China, which again motivates an increased adoption of robot technology. The adoption of robotics/market maturity is often measured by the number of robots deployed / 10,000 industry workers. South Korea has the highest penetration with 681 robots / 10,000 workers. The world average is 74 robots per 10,000 workers. China has 68 robots per 10,000 workers. The number has increased significantly over the last decade, but their adoption rate is still not even average and as such one would expect to a continued robust growth in adoption of robotics technology in China. It is interesting to note that a country such as Vietnam has seen an increase in sales of 410% year-over-year which could be a direct consequence of the increased salaries in China. It is now cheaper to manufacture elsewhere in Asia and as such, there is an increased pressure on China to automate or the manufacturing will move to other countries with lower salaries. The sales figures across all regions continue to increase. 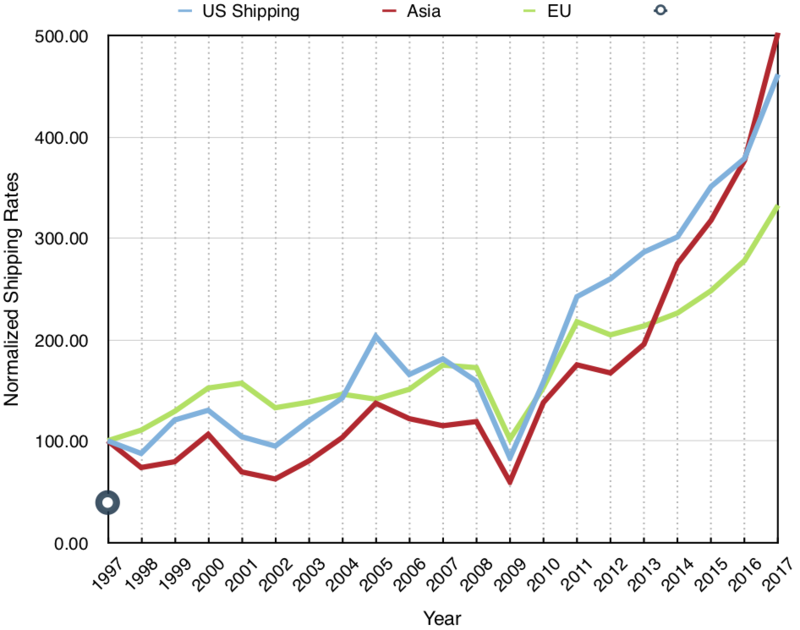 The normalized sales curves since 1997 are shown below for the regions Asia, US and Europe. Every region has robust growth but it is clear that the biggest growth, in particular since 2009 are in Asia/China. Europe saw 20% year-over-year growth, while Americas saw 22% annual growth. Other regions saw a 7% annual growth. The early numbers for 2018 do not indicate any slow-down. Overall the manufacturing industry is seeing robust growth and there are no immediate signs of any slowdown in the utilization of robotics technology. We are also seeing an increased utilization of sensor technology to make the processes more adaptive, and the use of collaborative robots opens entirely new markets, while the use of machine learning enables faster systems integration. The integration of new technologies is expected to increase the penetration into new markets. Shared Autonomy – are we close? We are at present seeing a lot of interest in autonomous systems. A lot of automotive companies are talking about autonomous cars or driver-less cars. GM and Google demonstrated early systems. Google started out with automation of regular cars and has also presented a concept system for a car without a steering wheel [URL]. Tesla has a model where the driver is expected to take over [URL] when the autopilot cannot provide a robust solution. The sharing of autonomy between well understood contexts – that are handled automatically and human intervention for challenge situation is a version of shared autonomy, where humans and robots collaborate to achieve a mission objective. Tele-operation of robots has existed for a long-time. Much of the early work was carried out in the handling of radioactive material, where direct contact by people is not an option. These systems were all purely tele-operated. This the same type of model we see applied to medical robots such as minimally invasive systems. The Intuitive Surgical System – Da Vinci [URL] is a great example of such a system. The objective is here minimization of trauma to the body. For Aerospace Systems we have long know the auto-pilot which is a shared autonomy system. The pilots will typically handle take-off and landing, whereas cruise flight is handled by the auto-pilot. For Unmanned Aerial Vehicles (UAVs) the pilots / operators are sitting on the ground and operating vehicles that may be airborne for as long as 36 hours. We are seeing similar applications for smaller UAVs for commercial and entertainment tasks. New commercial applications include building inspection and mapping of construction sites [URL]. For entertainment companies such as DJI [URL] build robots that are radio controlled. We are slowly seeing small functions such as level keeping or automation tracking of skiers which are examples of shared autonomy. The systems are launched and an objective is specified (tracker me, or maintain level) which is performed autonomously. One of the biggest challenges in design systems with shared autonomy is to provide the operator with adequate context to allow them to take over as appropriate. A great example of a system that does this in an industrial context is the company Aethon [URL] out of Pittsburgh. They provide delivery robots for hospitals and other institutions. The objective is an autonomous system, but when a robot gets caught in an unusual situation such as a trashcan in the middle of a hallway, the robot requests assistance from a call center. The operator uses the on-board sensors to understand the problem and drive the robot out of the situation. If you are in a car taking over control is more of a challenge when you are driving 55 mph down the highway. It takes time to understand the challenge and to take over, which challenges the design of such systems with automatic takeover. How do we provide the driver with adequate information to take over control of the car? Or is this an appropriate model for shared control? As we explore the shared control of systems with some functions performed autonomously and others carried out by an operator it is essential to consider the fluency of human-robot interaction, to consider the cognitive aspects of systems and to ensure that engineers use these models as an integral part of their systems design.Over the next few years we will see tremendous progress on design of systems that off-load the operator but we will be challenged in doing this in a way that still allows the operator to intervene for challenge cases. So far few systems have managed to do this with a high degree of fluency. We need more research at the intersection of cognitive science, system engineering and robotics to fully leverage next generation systems with shared autonomy. Over the last 4 years we have seen solid growth in robot sales worldwide. The biggest growth has been in China. Overall 70% of all robots are sold in China, Japan, Germany, South Korea and USA. 25% of all robots are sold in China. The growth does not seem to stop anytime soon. Why is that? Worldwide robot deliveries over the last 10 years. The growth since 2009 is dramatic. The CAGR since 2009 has been 17% and it is interesting that more than half of all robots sold are delivered to factories in Asia. The total value of the robot industrial market 2014 was $10B, and if integration is included the total value is close to $30B. This very much matches the general rule for cost breakdown – ~30% of an installed system is the actual robot, ~20% of the cost is related to other hardware such as the end-effector, fencing, and conveyors. 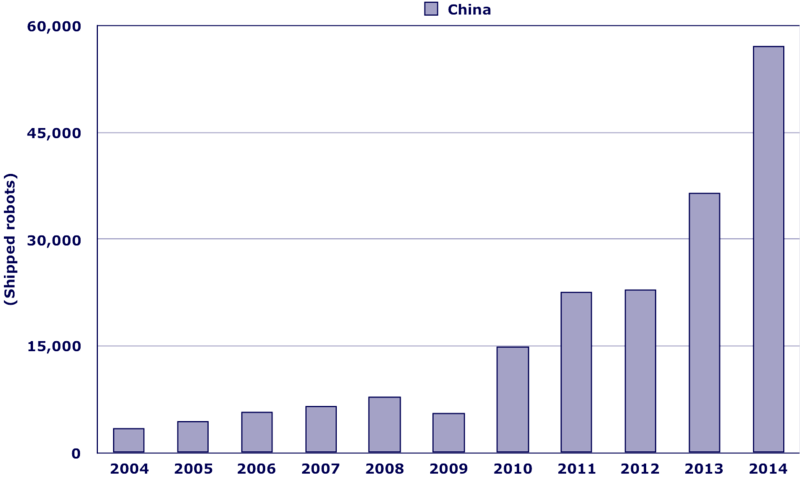 Sales in China has been particularly impressive with 50%+ annual growth that last 3-4 years. The growth has been very much motivated by a need to retain manufacturing in China. The hourly wages for manufacturing workers has gone up 350% over the last 10 years. 80% of the robots delivered were manufacturing by foreign companies or joint ventures in China. These companies experienced 49% year-year growth 2014-2015. The remaining 20% of robots delivered were made by Chinese companies. The annual growth (2014-2015) was 78% which is most impressive. The division of market shares is shown below (for 2014). As expected the biggest company was FANUC, but closely followed by ABB, KUKA and Yaskawa. The biggest Chinese company was Siasun, that is emerging as the leader from the Chinese companies. Already today more than 30% of all cars manufactured worldwide are produced in China. However, very few of these are sold outside China. First of all there is a major home market and in addition the industry is challenged by inconsistent quality. For robotics in general the main application area is still automotive, which takes up close to 42% of all robots sold. Electronics is number 2 and metal handling is 3rd. The fact that China has emerged as the largest producer of cars and also as a country with a need for automation to remain competitive points to a clear need for major growth in robot sales. Often the maturity of a market is measured by the number of robots deployed for every 10,000 workers in an industry. Korea has emerged as a leader with almost 500 robots deployed / 10,000 workers. Japan is second and Germany third. The world average for manufacturing countries is 87 robots / 10,000 workers. For 2014 China had only ~40 robots / 10,000 workers. Consequently China would have to double its robot inventory to even have average utilization of robots. If we zoom in on the automotive industry then the average penetration is 1 robots / 10 workers. Japan is the leader with use of lean manufacturing and a high degree of automation. Countries such as Germany, USA and S. Korea are all close to the expected 1/10. China on the other hand is closer to 1/30 as shown below. Consequently, one would expect to see major growth for the automotive market too. Salaries are lower in China, but the real driver is really quality of the final product. The big driver is consistent quality to ensure that product manufactured at any time of the day or any day of the week have the same quality. Frequently, the improvement in quality has been achieved through use of machine tools. They have a high stiffness and can generate high accuracy products with a high quality. One challenge for a factory that is laid out using machine tools is limited flexibility. It is difficult to change a factory line with a series of machine tools. In the automotive industry it is common to change the model at least annually and even with a common platform programming can be a major challenge. Consequently, we have seen an increased interest in utilization of robots as a replacement for machine tools. It is easier to change the end-effectors and industrial robots are designed for easy programming. Consequently, we are seeing a shift from machine tools to industrial robots. The general statistics for machine tools vs robots is shown below. Again China is only at half in its utilization compares to major markets such as USA, Japan and Germany. Consequently there is no doubt we will continue to see major growth in China and slowly we will also see a strong presence of Chinese companies. In some cases these companies will emerge directly from China and in some cases these companies will emerge from foreign acquisitions such as the Midea acquisition of the majority share in KUKA AG. Overall the robotics industry is expected to continue to see solid (~15-20% annual growth) but the major growth driver will without doubt continue to be China for the foreseeable future. Note: Many of the numbers in the post were adopted from the IFR World Robotics Publication. Over the last couple of years we have seen a major shift in industrial robot use worldwide. China, Japan and South Korea are responsible for 40% of all new robot Installation. China has more than 25% of all annual installations. The world market for robots grew 17% last year and has had a fairly steady growth since 2009. There are no indications that this growth will not continue for the next few years. Why all the automation in China? An obvious answer would be that salaries in China have increased by 320% over the last decade. This is clearly challenging the economic feasibility of out sourcing from major industrialized countries such as USA, Germany, Italy, Japan, … No doubt this is a factor. 10 years ago a popular statement was “the world is flat”, i.e., shipping is cheap and as such products can be made anywhere. This is not necessarily true anymore. However, a more important factor is product quality. In most cases automotive companies did not automate to reduce costs, but to build products that have a homogenous quality. China is slowly realizing that 7 days a week consistent quality is a key factor to international sales. To achieve this they need to have more robots for the plate shop, welding and paint operations. For electronics where tolerances are even more critical this is even more pronounced. Finally, China is trying to build a major aerospace industry where quality is second to none. All this points to continued major growth in robot use in China. In the past many of the robots have been built outside of the country or through joint ventures by companies such as FANUC, ABB and KUKA. Even today close to 75% of all robots are built by the big robotics companies. However Chinese companies such as GSK, Siasun, etc. are slowing gaining on the market. The accuracy and average MTBF are improving to a level that make these products competitive at least in China. No doubt the new generation of collaborative robots from UR, ABB, FANUC, etc are all going to be important for significant new growth in Asia. Through use of new technologies such as machine vision, machine learning, … we will see major new growth in robotics, but most of it will be in Asia at least for the short-term. How will the growing use of robots change people’s lives and make a difference for society? How do teens want robots to make a difference in the future? As ever more capable robots evolve from the realm of science fiction to real-world devices, these questions are becoming increasingly important. And who better to address them than members of the generation that may be the first to fully co-exist with robots in the future? Through its new Robots4Us student video contest, DARPA is asking high school students to address these issues creatively by producing short videos about the robotics-related possibilities they foresee and the kind of robot-assisted society in which they would like to live. Winners of the student video contest will attend, as DARPA’s guests, the DARPA Robotics Challenge (DRC) Finals, to be held in Pomona, Calif., June 5 and 6, 2015, at which teams of engineers from around the world will compete for $3 million in prize money as the robots they’ve created demonstrate their skills in the domain of disaster response. Student video contest winners will also get to participate in a special program in Pomona on June 7, which will bring together students and experts in technology and society to discuss the broader implications of a robotics-rich future. U.S. high school students (grades 9-12) interested in participating in the contest are asked to submit a two- to three-minute video describing their vision for a future robot-assisted society. Videos should consider both current and anticipated advances in robotics technologies, and the implications of these advances for individuals, workplaces, and communities, as well as for national security. Five winners, along with one parent or guardian each, will receive a trip to attend the DRC Finals, where they will watch some of the world’s most sophisticated robots respond to the kinds of challenges posed by natural and man-made disasters. Following the event, winners will take part in a special panel to discuss the ideas and views they featured in their videos. A “people’s choice” winner also will be selected based on public voting on videos that DARPA will post on YouTube in mid-April. Submitted videos will be judged on the basis of clarity, creativity, thoughtfulness, originality, and appeal of the submitter’s vision of how robots could make a difference for society and the kind of robot-assisted society they would like to see—as well as the technical quality of the video. Videos by winners and other selected entrants will be featured on the DARPA website, YouTube channel, and other social media networks. The contest begins on February 11, 2015, and entries from individuals or teams will be accepted through April 1, 2015. For more information and detailed rules and requirements, visit http://www.theroboticschallenge.org/Robots4Us.